Photographer Ashley Evans started the “Babies with Teeth”, or infants with grown-up teeth ‘Photoshopped’ into their mouths, after playing around with an app called YouApp. Photoshop was required to edit some of the babies, while the rest were touched up directly in the app. “I had an app and wanted to see what my son looked like with teeth. It was hilarious so I did it to my daughter. I then posted in a Facebook group and it just blew up from there,” Evans told PetaPixel. Read more for some of the most popular images from the series. Photoshop guru James Fridman continues to accept photo retouching requests through social media, and the results are as literal as ever. 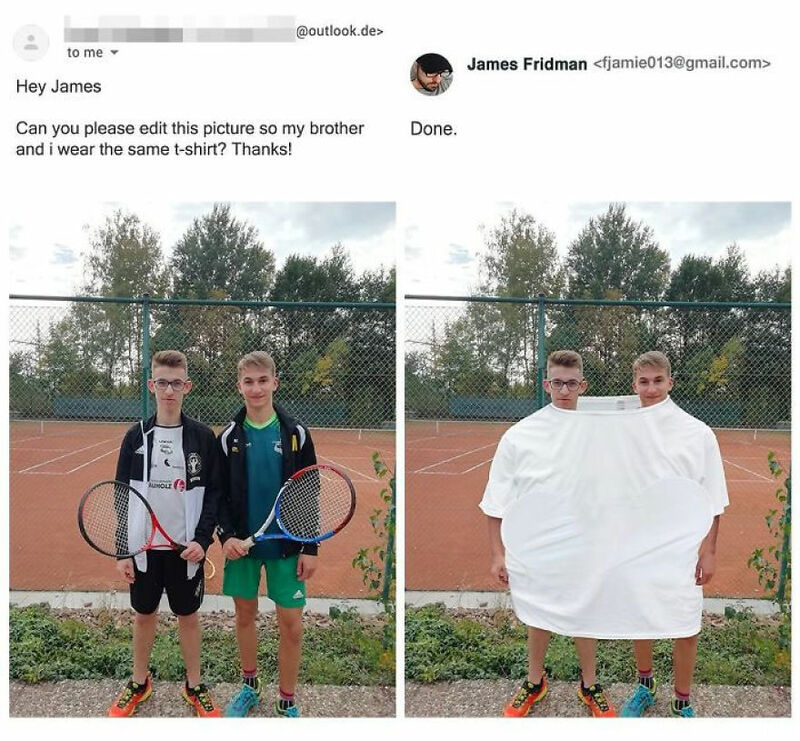 For example, the two brothers above requested to have both wearing the same shirt, and James ended up wrapping them both in one giant garment instead. Other examples include: relocating people, giving someone wings, making a person shorter, and more. Continue reading to see seven of his latest requests. Adobe’s Photoshop CC October 2018 update adds several new functions, including a new Content-Aware Fill workspace that lets you change the selected source and adapt content based on rotation, scale, and mirroring. Previously, the software was limited to a simple select and delete functionality. In other words, the Content-Aware fill tool can now replace missing sections of a photo with something that doesn’t exist perfectly in the original itself, thanks to artificial intelligence. Read more for another in-depth video along with additional information. Today at the Adobe MAX 2018 conference, Adobe introduced MovingStills for the Creative Cloud, a feature that lets you essentially transform still photographs into cinematic sequences. It uses artificial intelligence to create a parallax based on the photo’s data, which is turned into a video shot with a moving camera. Continue reading for the full tech demo video and more information. Adobe announced Photoshop CC for the iPad at its annual Adobe MAX conference, offering a full Photoshop experience for your mobile device. “We’re completely rethinking the user experience for a modern touch device. You’ll find it familiar, but also adapted in smart ways for the device. We’ve designed Photoshop on iPad with natural touch gestures in mind to speed up workflow. No exporting, importing, converting to different formats, or fixing whatever didn’t properly convert. It all just seamlessly works” said Adobe. Continue reading for a hands-on video preview and more information. It’s that time again, time for yet another installment of Photoshop trolling. This time, we bring you three quick and easy ways to become a Photoshop troll in the areas of headshots, missing cars, and gold rims. Continue reading to see them all. While not as complex as this Photoshop trolling, this one shows why you should never ask an elite troll to change the background for you in any photo, especially to black. Let’s just say that the job was completed, but in a figurative way. Continue reading to see why. Sometimes, you just need to crop a person or two out of a photo, but when you ask a Photoshop troll for help, things can get a bit weird. This person wanted “the man on the tricycle” placed on a white background, and what he got, was something totally different. Continue reading to see the aftermath. Replacing one color with another in Photoshop sounds easy enough, right? Even for beginners, this can easily be accomplished in 2-3 steps, but when you ask for the help of a Photoshop troll, expect the unexpected. Continue reading to see what happens in this request. You’d think that making someone look good, or an entire family, in Photoshop would be easy enough for those with experience, but the art of trolling would beg to differ. Let’s just say that this person didn’t quite get what they were asking for. Continue reading to see why.